The Propex HS2000 is an extremely energy-efficient and economical propane gas fired furnace. An automatic, thermostatically controlled, blown air heating system offering a source of economical heat totally independent of the engine. 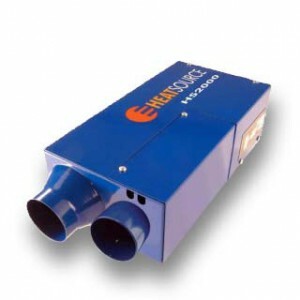 The Propex HS2000 Heatsource Furnace is designed especially for automotive and marine applications. Quiet: balanced fans and smooth motors help keep noise to a minimum. The solid-state electronic thermostat is an easy to fit surface mount design. It automatically switches the unit on and off to maintain the desired interior temperature. When the temperature drops below the selected level, the HS2000 will automatically ignite and run until the cabin reaches your ideal temperature. The intelligent electronics use minimal electric current during ignition so cycling the HS2000 on and off does not have the effect of additional battery drain. Safety is always our top priority at Propex. In addition to passing strict European standards the furnace’s intelligent electronics constantly monitor the operation of the heater to make sure everything is operating perfectly. The flame, case temperature, combustion airflow, gas solenoid valve and voltage are scanned continuously. If a problem is detected the heater will instantly switch off and the red light on the thermostat will flash to let you know there is an issue. The HS2000 Furnace is supplied complete with either a vehicle or marine fitting kit. The 22mm i.d. (7/8 inch) stainless exhaust ducts are supplied as standard in lengths of 29.5 inches (750mm) for vehicles and 39.4 inches (1 metre) for marine applications. Avoid purchasing heaters from European distributors as these will come with kits to suit European Metric gas fittings. The marine kit features an attractive polished stainless steel through hull fitting which accepts the stainless steel pipes for the flue outlet and the combustion air inlet. The kit also includes extra ducting and stainless steel bulkhead mounting brackets.